A classic blush bow tie, decorated with scattered polka dots. The perfect option for any special occasion. Pair with navy, black or grey suits for a classic, formal look. Can I get the kids bow tie as a self-tie? Unfortunately, we only make kids bow ties available as standard pre-tied. Can I get a matching handkerchief for a child? If you’d like to add a children’s handkerchief to your order, please contact customer services, who will be happy to advise. Depending on the fabric and design, we may not be able to make it, but please don’t hesitate to ask. Please note, we will only fulfil this request when part of an order and can’t make a handkerchief alone. As these items will be made bespoke for you, they will be considered non-returnable. 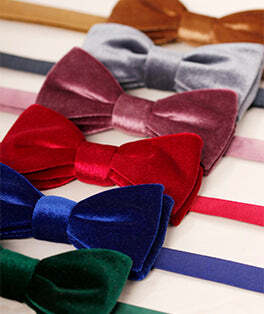 These children's bow ties are only available pre-tied and fixed to maintain their shape. They have an adjustable strap with a hook and eye fastening.